This chapter will begin by discussing the basic philosophical concepts addressing human nature (i.e., greed, opportunistic behaviors, altruism, and prosocial behaviors) as described by the British empiricists Jean Jacques Rousseau and John Locke. The views of Locke and Rousseau are discussed in the social contract theory and are particularly relevant in examining the relationship between community growth and development, individual human rights, and the rationalization of human greed. 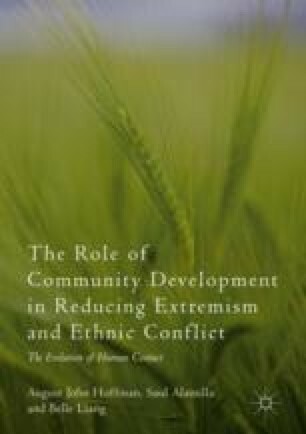 We will also discuss how these principles may be applied to groups and communities involving human interaction (i.e., intergroup contact), superordinate goals, and interdependency as essential factors in the development of cooperative alliances and related benefits (i.e., reduced conflict and aggression). Finally, this chapter will explore the history and development of cooperative exchanges and how communities might facilitate the frequency of prosocial, altruistic, and opportunistic behaviors. Rousseau, J. J. (1762). The social contract, or principles of the political right. http://ebooks.adelaide.edu.au/r/rousseau/jean_jacques/r864s/.